There are plenty of moments in “Memphis” when you want to just stand up. And it’s not because the score is so joyous. It’s because you have an instinct to stop injustice, to cheer idealism, or just to get a tad bit closer to all of that boundless energy. Seeing the Broadway production of “Memphis” earlier this year was a reminder of what white-hot theatrical fire looks like (Read the review here). And much like Tracy Turnblad, the plump idealist of the musical “Hairspray,” disc jockey Huey Calhoun has taken it upon himself to rail against racial injustice, fighting back the only way he knows how. He’s a budding Machiavellian music promoter, yet his hijinks do two things – make lots of money for the station he bullied himself into while playing the kind of music white kids are looking for. While the parents of the mid-1950’s were pushing the calming sound of Perry “Coma,” Huey decides the only way to get the new sound in the middle of the radio dial is to break down the walls himself. Joe DiPietro and David Bryan’s show opened to an adoring Broadway San Jose crowd to kick off the newest season of the company. It was a homecoming of sorts for the show, considering it was developed at the 2002 new works festival at Theatreworks just up the road, also receiving its world premiere there a few years later. And while some national tours may be a little off-the-mark, that is hardly the case with the most recent crew. Bryan Fenkart steps strongly into the touring cast. With an engaging face and pipes to match, Fenkart was strongest in the most poignant of moments. Whether it was raging against the white establishment, ready to fight for his dancers or his pathos-fueled rendition of “Memphis Lives in Me,” Fenkart did a wonderful job of letting those around him affect his choices. Every part his equal was Felicia Boswell, who played Felicia. She is a sharply attractive lady who herself did some nice work in the discoveries – the moment where her vinyl .45 was shattered, the zinging anger when she realized that Huey felt he was blacker than her, or one of the most heartbreaking moments when she and Huey discuss the arcs of their lives in a dingy radio studio that probably couldn’t produce enough watts for a firefly. Other actors offered plenty to the Memphis soul stew. Horace V. Rogers’ Delray does not cut the presence of Broadway’s J. Bernard Calloway, but still does some nice work reminding Huey that, whether Huey likes it or not, his sister is not to be messed with. After all, Delray was physically slashed and scarred for drinking out of a white’s only faucet many years prior, because “I was thirsty.” None know better about the collateral damage of racism than he, and his rendition of “She’s My Sister” illustrates the point marvelously. Julie Johnson absolutely brought the house down in her gospel-fueled “Change Don’t Come Easy.” And in one of my all time favorite segues into intermission, as well as one of musical theatre’s most powerful payoffs, Gator’s (Rhett George) “Say a Prayer” left the eyes misty with beauty. His acting prowess, while not as empathetic as Broadway’s Derrick Baskin, still allowed for an inner-beauty that was organic and discovered. Sergio Trujillo’s choreography is full of energy and joy throughout, in addition to plenty of hilarity with things like the “Gator Dance.” While shows like “Memphis” are shaped by the director’s choices, they are given their soul by their choreographer. Numbers like “Underground,” and “Crazy Little Huey” are wonderful showcases for tight choreography, and the company more than delivered. 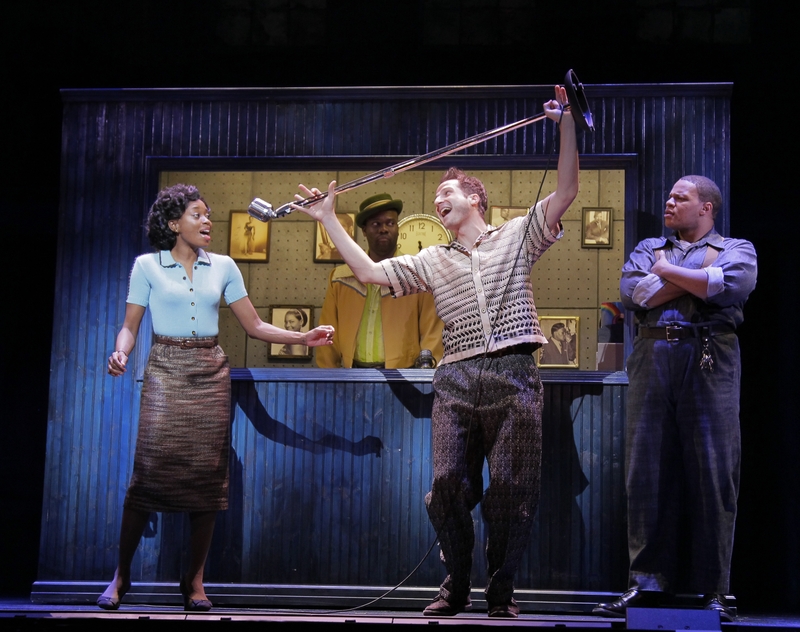 Shows like “Memphis” are reminders as to why the musical theatre genre continues to thrive. Certainly, it is not the perfect show, and there are elements that have been covered in other shows prior. But it certainly is joyful, poignant and follows a critical moment in our nation’s history. And when you see a show that has this kind of energy, panache and charm, there is only one thing left to do at the end.